What Should I Feed an Older Cat? Figuring out what to feed an older cat is very much about assessing his health and nutritional needs on an individual level. As cats age, their systems wind down, and their nutrient banks slowly become depleted. Additionally, certain health conditions can require dietary adjustments to help maintain quality of life. Cornell University's College of Veterinary Medicine brings up two important points when it comes to cats older than seven years of age. First, aging is unavoidable. Secondly, diet can sometimes be used to prevent disease and maintain a certain level of health. All cats will eventually grow older and slow down, but reducing lifestyle habits that pose health risks is of utmost importance to your cat's overall quality of life. This is so very important during the final stages of your cat's life. Peteducation.com points out that older cats, due to malabsorption issues, often require higher levels of fats than do younger cats. Also, unlike most humans, a cat's caloric needs remain the same as it ages. Unless your cat suffers from extreme obesity, it should ingest a consistent amount of calories during its life. Do note, that none of these foods alone provides balanced nutrition for a cat. Consult a veterinarian before supplementing or replacing cat formulas for home-made foods. Also, canned fish products shouldn't be used too liberally, as they can put your cat at risk for mercury poisoning. One important nutrient category has been left off the list is protein. Many older cats suffer from kidney problems. Even where kidney disease is fortunately not present, an aging cat will typically experience some degree of kidney impairment. Poor kidney function leads to poor protein metabolism. In such cases, protein levels must be lowered, or the protein provided by food must contain easily digested proteins. Sodium is an important mineral and electrolyte. However, many aging cats suffer from heart disease and even high blood pressure. In such cases, low-sodium cat formulas are vital. Vetinfo.com emphasizes the importance of senior cat foods being formulated specifically for your cat's health needs. Some veterinarians and pet owners support the concept of making homemade food for your cat. Homemade foods can provide a healthier and more individualized alternative to store brands. However, when it comes to formulating cat foods in your kitchen, always consult with a veterinarian or a reliable source. Cats require different levels of nutrients than humans, including specific vitamins and amino acids that are easily depleted by an inadequate diet. Also, discuss dietary supplementation with your vet before administering any products. Sometimes, supplements that are high in one nutrient can upset the delicate balance of nutrients in your cat's system. Supplements are best used in the presence of an actual deficiency. What is not in your cat's food is just as important as what is in it. Some commercial food brands use artificial ingredients, addictive flavorings, and chemical preservatives which may be difficult for your aging cat to process. Though younger cats have stronger systems that can deal with such ingredients more efficiently, in the case of a weaker or immunosuppressed older cat, these agents may exacerbate any health conditions. When it comes to helping an older cat receive its necessary nutrients, try to keep things simple. 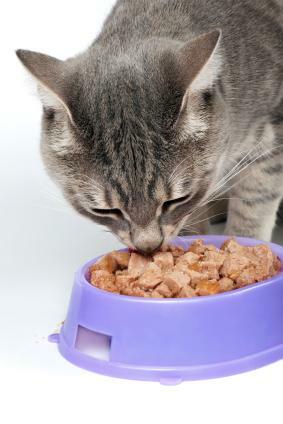 Feed your cat only the healthiest, cleanest foods from trusted brands and sources. Doing so may help to lower the toxic burden and promote overall health.